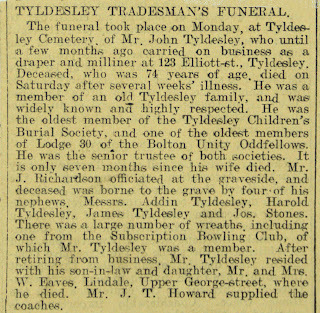 TYLDESLEY TRADESMAN'S FUNERAL.The funeral took place on Monday, at Tyldesley Cemetery, of Mr. John Tyldesley, who until a few months ago carried on business as a draper and milliner at 123 Elliott-st., Tyldesley. Deceased, who was 74 years of age, died on Saturday after several weeks' illness. He was a member of an old Tyldesley family, and was widely known and highly respected. 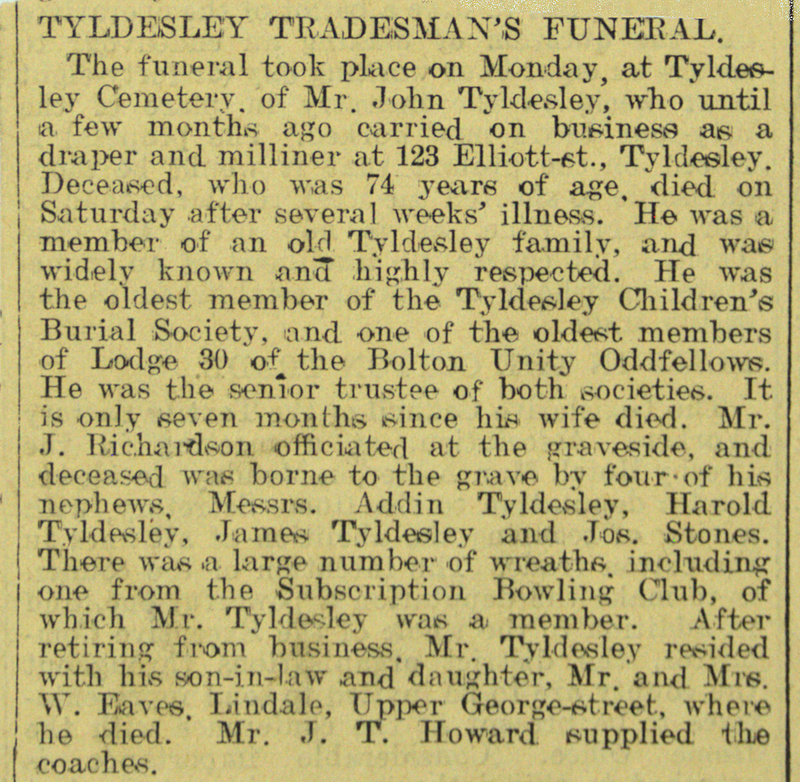 He was the oldest member of the Tyldesley Children's Burial Society, and one of the oldest members of Lodge 30 of the Bolton Unity Oddfellows. He was the senior trustee of both societies. It is only seven months since his wife died. Mr. J. Richardson officiated at the graveside, and deceased was borne to the grave by four-of his nephews, Messrs. Addin Tyldesley, Harold Tyldesley, James Tyldesley and Jos. Stones. There was a large number of wreaths, including one from the Subscription Bowling Club, of which Mr. Tyldesley was a member. After retiring from business, Mr. Tyldesley resided with his son-in-law and daughter, Mr. and Mrs. W. Eaves, Lindale, Upper George-street, where he died. Mr. J. T. Howard supplied the coaches. John Tyldesley was born on 3 July 1834 and died on 24 April 1909. He married Martha Stones, who was born on 3 January 1832 and died on 25 September 1908. As can be seen from the next posting, their gravestone still stands in Tyldesley Cemetery. The shop at 123 Elliott Street is now Frank's Café.